We've been running flower arranging workshops here at Flowers 'n' Things for around 10 years now, and we just can't get enough of it! We love nothing more than engaging with other enthusiasts and helping to nurture their passion for flowers. 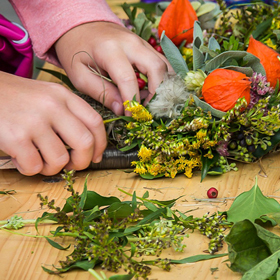 Our workshops are lead by Jo, who will help you create a beautiful floral arrangement using seasonal flowers. No prior experience is required to attend these workshops, as we can support everyone from novices through to more experienced flower arrangers. Our regulars love how fun and informal our workshops are, and alongside all your materials and tutoring we also include coffee and biscuits! Take a look below at availability and give us a ring to book yourself or a loved one onto one of our workshops now. These workshops run between 10am-11:30am, and cost £25 per person. Please call us on 01775 769306 to book your place now! 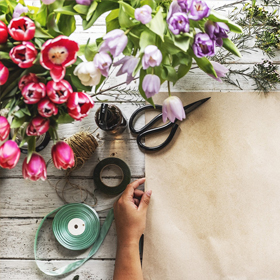 We are delighted to be able to offer a floristry course aimed at complete beginners who would like a more in depth introduction to floristry than our half-day workshops. Your tutor will be Jo, who will show you a variety of techniques and skills over 5 sessions. We aim to cover hand-tieds, arrangements, wreaths, button holes, and corsages, but usually add in some extra surprises for you too! Our small class sizes, of up to 6 people, means your tutor can focus on you as an individual and you'll become a really close-knit group with your peers too. We provide all materials, tutoring, and even serve coffee and biscuits each week too! Take a look below at availability and give us a ring to book yourself onto one of our courses now! These workshops run between 10am-12pm, and cost £195. Please call us on 01775 769306 to book your course now!